Life-Size Mouse Trap Needs Your Help! Mark Perez’s Life Size Mouse TrapIf you’ve been to Maker Faire in recent years, you’ve no doubt noticed the Mark Perez’s Life Size Mouse Trap holding center stage in one of the outdoor areas just waiting to go for a spin. 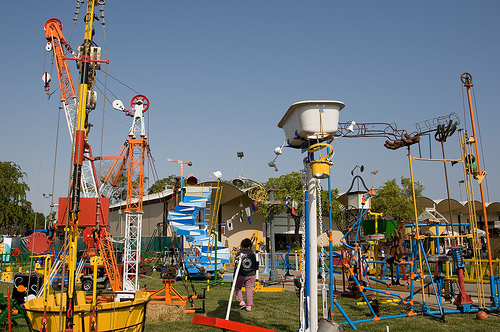 If you haven’t already seen it, this giant “toy” is a Rube Goldberg machine come to life. Weighing in at two tons, the mouse trap takes four days to set up and a one day breakdown with a 10 person crew. Inspired by the board game Mouse Trap, this Bay Area troupe has been delighting audiences with their giant kinetic sculpture since 2008.
wow! thanks, yes we have just days to meet our fundraising goal and if we don’t reach it, we don’t get any of it! turn your small donation in to something BIG, REALLY BIG! support this educational art project, live performance, bio-fuels… all with one small donation!